In case you missed it, Pete Davidson and Ariana Grande are Instagram official. After days of rampant speculation, it was all confirmed Thursday, May 31st, when Grande shared a photo of the new couple engaging in some adorable PDA. Yep, it was the kiss pic seen ’round the world. Unless you’re Cazzie David, Davidson’s very recent ex-girlfriend, that is. 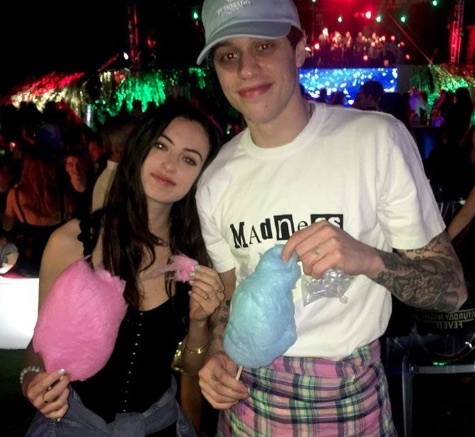 It was announced only weeks ago that Cazzie David and Pete Davidson had broken up after more than two years together. (Similarly, Grande split from rapper Mac Miller around the same time.) Rumors of Cazzie’s former beau’s new relationship surfaced just days later. But the actress and writer had yet to respond to the headlines — until now. Seriously, it’s the casual clapback to end all clapbacks. And the best part? Celebs like Amy Schumer, Lorde, and Tallulah Willis all shared their support in the comments. “You’re Amal,” Schumer wrote, meaning Amal Clooney. “You’re so hot omg,” added Lorde. And Willis wrote what we’re all thinking: “Like is this the new [background] of my phone.” There’s nothing better than women supporting women, amiright? Pete and Ariana do make a cute couple. But we’re also happy that Cazzie David seems to be living her best life in spite of her breakup. David, daughter to legendary comedian Larry David, reportedly started dating the Saturday Night Live star back in 2015. In 2017, Davidson credited his then-girlfriend with helping him get sober. Davidson casually revealed his breakup from David in an interview on Complex’s Open Late with Peter Rosenberg. We think she will be, too.